This preview has been provided by Chamber Music Raleigh. 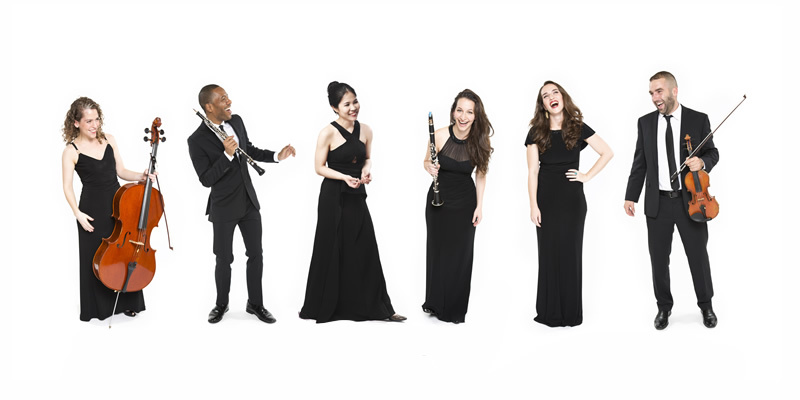 On Sunday, February 3 at the North Carolina Museum of Art’s SECU Auditorium, Chamber Music Raleigh presents Ensemble Mélange, a joyful sextet of virtuosi who shake up the concert experience, by forging a personal connection with the audience. The ensemble features violin, cello, piano, oboe, clarinet and soprano and mixes tried-and-true repertoire with a smorgasbord of jewels from distant genres. The concert is reformatted as a musician's party game; after each piece, members of the audience are chosen to pick the next piece from an extensive menu organized by style, nationality, and time period. Whether you’re a purist or a populist, a snob or a noob, eight years old or eighty years old, you’ll leave charmed and punch-drunk on a piece you didn’t know you were going to love. With a philosophical investment in reaching out to children, the group is dedicated to bringing in the next generation of music lovers, as well as having good fun with the current one. Everyone in the audience has a program with a number on it. We quickly explain the rules of the game, and then after each piece, a new member in the audience is chosen by a randomizer app to choose the next piece. The program includes classical music of a wide variety of genres, brilliant transcriptions, some jazz, innovative arrangements of tango and musical theater, and pieces that were written specifically for the group. It is a concert that is fun for audience members of every age, walk of life and musical predilection.